On August 7, the Extraordinary Chambers in the Courts of Cambodia (ECCC) found two senior leaders of the Khmer Rouge, Nuon Chea (88) and Khieu Samphan (83), guilty of crimes against humanity. The defendants — Chea, wheelchair-bound, and Samphan, standing — showed no visible emotion when Judge Nil Nonn read the verdict. Outside the courtroom, surrounded by a phalanx of waiting journalists, victims embraced and wept. For many victims who have been waiting for 35 years, the judgment still felt like bittersweet justice. More than 1.7 million people—a quarter of the population—were killed during the Khmer Rouge regime in Cambodia from 1975 to 1979. The ECCC is a hybrid court –with national and international prosecutors and judges - that was created by the Royal Government of Cambodia and the United Nations in 1997 to prosecute Khmer Rouge senior leaders and those most responsible for genocide, crimes against humanity, and other serious abuses. In 2007, it opened its first case, against Kang Kek Iew (71), also known as Duch, the former head of internal security for the Khmer Rouge and overseer of the Tuol Sleng (S-21) prison camp. Kek Iew was sentenced to life for crimes against humanity in 2012. “This judgment is a welcome step in recognizing the rights of those who suffered and in punishing those responsible. However, for various reasons the ECCC trials have taken a very long time to prosecute very few people. Important as the trials are, the citizens of Cambodia need and deserve more,” said Paul Seils, ICTJ’s Vice President. “In order to meaningfully address past atrocities, Cambodia needs to broaden the scope of its accountability efforts, going beyond trials to include creative and substantial measures to acknowledge the truth of what happened and to memorialize it in a way that assists in ensuring non-recurrence. Meaningful and comprehensive reparations are needed to complement the measures of truth and justice if the victims who continue to feel ignored are to experience a genuine vindication of their rights”. The long wait for justice has been a source of frustration for many victims. Pol Pot, the leader of the Khmer Rouge, died in 1997 before he could be brought to justice. The trial of Chea and Samphan—Case 002/01 at the ECCC—was originally meant to include two additional defendants. Ieng Sary, the Khmer Rouge foreign minister, died in 2013; his wife Ieng Thirith held the rank of social affairs minister and was deemed unfit for trial due to dementia in 2012. Case 002/01, which began in 2011, marks the first convictions against the highest-ranking leaders of the regime. Chea and Samphan were sentenced to life in prison for crimes that took place during the forced displacement of Phnom Penh in April 1975, a second phase of forced displacement in 1976, and the killing of former soldiers of Lon Nol– the US-supported military leader of the previous regime who deposed Prince Sihanouk in a coup – in 1975. Last week’s judgment included the recognition that 3,866 victims who were civil parties to the trial had the right to reparations. The Communist Party of Kampuchea, known as the Khmer Rouge, took control of Cambodia in 1975. As part of their radical Maoist and Marxist-Leninist program to transform the country into a rural and classless nation, they evacuated its main cities and forced entire populations to live in the country to perform agricultural work, with insufficient food and medical supplies to support the swelling number of the internally displaced. The capital city of Phnom Penh, which had a population of about 2.5 million in 1975, was almost emptied. Nearly 20,000 people died during this phase. After reaching the countryside, civilians were forced to work as slaves in the fields for 12 to 15 hours a day. Those considered “enemies” to the new Communist regime — including intellectuals, those with connections to foreign governments, and ethnic Vietnamese, Chinese, and Thai — were rounded up, taken to prison, and tortured. Most were later taken to “killing fields” where they were executed and buried in mass graves. In addition to those who were killed in concentration and labor camps, thousands more died of starvation, malnutrition, and disease. The Khmer Rouge regime lost control of the country when Vietnam invaded Cambodia in 1979. A pro-Vietnamese government, the People’s Republic of Kampuchea, was formed, and civil wars raged throughout the 1980s. Following a UN peace-keeping mission and two conferences in Paris in 1989 and 1991, UN-sponsored elections were held in 1993. In 1998, a coalition government stabilized the nation and led to the surrender of what was left of the Khmer Rouge. In contexts where repression and political instability has impeded a broad process of truth and accountability, tribunals can do more than hold perpetrators accountable for their crimes. In Cambodia, the work of the ECCC has shed light into the heart-rending atrocities committed by the Khmer Rouge in the late 1970’s, legitimizing a truth that had been denied for decades. "Measures to affirm the larger truth could include working with survivors on oral history projects and ambitious programs to educate young people on this history." Sophany Bay is a Cambodian-American victim of the Khmer Rouge who is represented by the San Francisco-based Center for Justice and Accountability (CJA). In June 2013, Bay testified at the ECC about the harms she and her family experienced during the forced displacement and the lasting traumatic impact during a victim-impact hearing. Bay, who lost all three of her children due to the cruel conditions imposed by the Khmer Rouge during the evacuation of Phnom Penh and life in the work camps, said she testified in memory of her children and all of the victims. “When my last daughter died, I became almost insane. I could not do anything. I had nothing left for my life…I did not talk to anybody; I cried by myself, I wanted to die with my children... 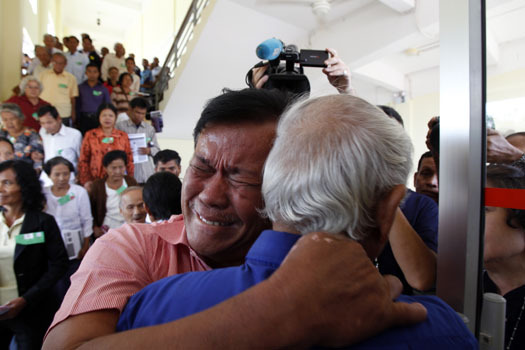 They died because of the Khmer Rouge soldiers,” Bay told the court last year. “I would like everyone in this court to understand my sorrowful life,” she said. “Criminal trials of the kind going on at the ECCC are extremely complex procedures, whose details are likely to put off the public and frustrate the victims. The information they produce about the crimes is necessary and useful, but often selective and narrow,” said Eduardo González, director of ICTJ’s Truth and Memory program. The ECCC has devoted considerable attention to outreach and provided an opportunity for victims and civil society to contribute to shaping a shared narrative of the past as well as a platform for individual truth telling and self-affirmation. Over 98,000 people have visited the court to watch trial hearings, and millions more have seen its proceedings on television or online. Many Cambodian NGOs have organized outreach and education activities about the trials, worked to increase victim participation, and facilitated legal aid to victims throughout the operation of the ECCC. Inspired by non-judicial initiatives like truth commissions, civil society organized three “Women’s Hearings,” where survivors of sexual violence could share their experiences, in response to the limited prosecutions for these crimes. “Not only did these hearings empower and honor the survivors who testified, but by breaking the silence around sexual violence crimes they also contributed an important accurate record, public awareness, and community healing,” said Amrita Kapur, Senior Associate of ICTJ’s Gender Justice program. Chea and Samphan will stand trial again in the fall for another set of charges, including genocide, forced marriages, forced labor, and war crimes. Although other aging Khmer Rouge officials have been investigated by prosecutors, no further indictments have been made by the ECCC.